What are those objects and where do they come from? Throughout the country, there are local communities concerned with preserving their historic heritage. As a result, small historical societies and museums are created to help preserve this history. Many of these organizations are volunteer run and often they do not have proper museum training, especially in regards to the management of museum collections. These museums often hold collections with minimal information and as a consequence can create difficulties in future research and development. The AMIHS was one of those museums. It was created in 1992 by community members concerned with their changing community. Many of the long time residents were moving away or passing on and rapid redevelopment of the island had begun to take place. AMIHS set out to capture this history before it disappeared and in 1997 also started collecting historical artifacts to help tell these stories. Over the next 18 years they amassed over 1300 objects, a historic 1920s cottage and many more archives and scrapbooks still being processed. Many years later in 2014 on one hot Florida summer day, an unknown museum person visited the collection and commented to the volunteer on duty that the museum was not being a good steward to their collections. From this moment, the museum began thinking about its collections differently and initiated a relationship with a local museum consultant (this author). The consultant was initially brought in to perform a site evaluation to outline the preservation concerns and recommendations for implementation. One of the major recommendations was to complete a full inventory and cataloging of the collections. Based on the recommendations and the evaluation, the museum chose to move forward with the cataloging project. The museum decided to close for a month and a half (during the slowest part of the year for tourism) to allow the consultant full access to the museum unheeded by volunteers and patrons. The consultant set up an assembly line type process and went room by room numbering, photographing and taking notes in a spreadsheet, as well as adding buffers and other preservation tools to better protect the objects on display. Over time, the process became streamlined and focused on the photography. A large set of objects would be laid out, then all of them numbered followed by photography and then put back on display. During the photography, the consultant would first photograph the number of the object and then photograph the object. Once the images were uploaded to the computer, the images were all renumbered to reflect the object number. This method allowed the consultant to do most of the cataloging work off site. Armed with high-resolution images of the collection, the consultant could easily add nomenclature 3.0 vocabularies and perform some web-based research. After the collection was fully numbered and cataloged (in the end, estimated time per object came to 7 minutes), the archives and local newspaper records were consulted for any possible donor information. Since the consultant knew the collection very well at the end of the cataloging, it was easier to match up donor information to objects. At the end of the cataloging project, the museum was fully cataloged, numbered, and photographed, but now what should be done with all the information? A hard copy was provided to the museum for easy access, but the museum needed a computer solution that was more than just an excel spreadsheet. The museum, however, had a number of hurdles, the main one was that there was only one computer on site and it spent most of its life in the closet. There was no server and no real tech support available. 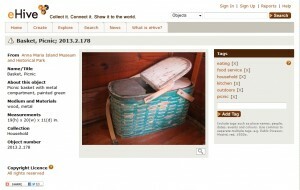 The museum needed an inexpensive, cloud, web-based solution. With this information, the consultant set about researching all the available open-source and web-based collections management software solutions. Attached is the initial report on the various systems that were analyzed (includes the cost, and a list of pros and cons). With this report and lengthy conversations with the museum, the choice was narrowed down to two choices—eHive and OMEKA. Collections items were added to both solutions and then showcased to the board of the museum. Armed with all the information, the museum choose eHive. Once the collections management software was chosen, the museum and the consultant worked with the database company to map the data into the collections database. The AMIHS now has a useable, searchable museum collections database—one they can easily point researchers to, as well as to actively add new accessions, and add the archival data into the database. Ashley Burke is the collections manager at the Leepa-Rattner Museum of Art in Tarpon Springs, Florida and a museum consultant for Burke Museum Services. She has over a decade of experience in museums with a variety of types of collections from fine arts to decorative arts to natural history to archeology to medical collections (including wet tissue). She has a passion for all things museum related, Florida history and is a part-time metalsmith. She makes museum inspired jewelry in her free time. Congratulations on the project! Very elegant and simple solution to the situation. The Museum looks to have a sustainable system to move forward with thanks to the effort put into the initial cataloging and description effort. Very glad the Museum stakeholders had the foresight to allow the “nuts and bolts” of inventory,cataloging, photography and numbering to happen during a closed period. They will reap the benefits for a long time in terms of ease of access and ease of sustaining the system. Great article on the process. thank you for the ideas and the information. Actually you can create thewandering site for the exhibition easily! You have all the information about the item . You need just to add an activity to each item, and then you are ready to create a station. when you have 9 stations you can gather them together to a puzzle.